Fall Back with Savings on our Leaf Pick up Services! There’s nothing quite as frustrating as losing your gorgeous fall weekends to yard work. You could spend hours raking leaves only to find your hard work undone by a breeze or the next round of dropping from the trees within days – sometimes hours. It’s not only a lot of work, but often requires timing as most townships will only offer leaf pickup services a couple of times each season. You end up with ugly leaf piles that end up blowing back up onto your sidewalks and lawn. 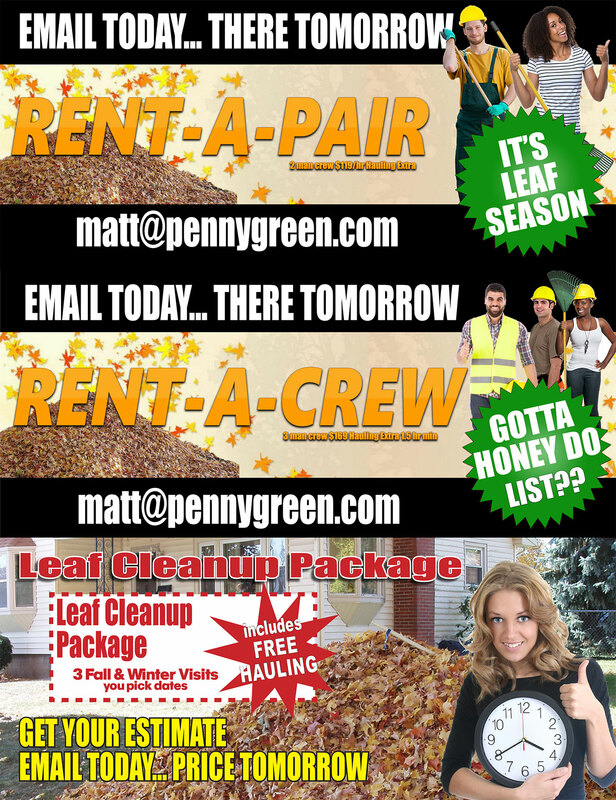 PennyGreen offers Clean & Haul services all year long! It’s TIME to call PennyGreen! The Clean” is a 2-man crew services for $119 per hour. Hauling away leaves is additional. 3 Fall & Winter Visits including haul away. Packages more for large or heavily wooded properties, great deals available email us now. Did you miss your township’s leaf pick-up day? Don’t want to wait that long? We’re now offering up to 30% off our leaf removal services. All you have to do to get started is call 856-435-5799 or fill out our contact form to set up a consultation!